As an unannounced change in this morning's patch 3.1.1, Exorcism can no longer be used against players. The stated rationale for this change not being announced ahead of time was that they were "trying to get the tooltip changed at the same time to reduce confusion," which doesn't quite seem to hold water for me - wouldn't it be less confusing to tell the players, and not leave them to find out for themselves the next time they tried to PvP? Anyway, that's a relatively minor issue. Recall that in patch 3.1, Exorcism was changed to be usable on all targets, and to automatically crit against demons and undead (before, it could only be used against demons and undead). Evidently Blizzard feels that it's just too much burst damage for Ret pallies in PvP, especially given that it means they can start up their combos from range. Edit: Just to clarify, the functionality of Exorcism in PvE is unchanged. Ghostcrawler also promises that they're working on making Pally DPS "more interesting and also less bursty" instead of just using all your skills on cooldown, and that once they figure out how to do that, you'll be able to Exorcise other players again. He gives Conflagrate, Brain Freeze, Rip, Overpower, and Arcane Blast as examples of the kind of more interesting mechanics they might be going for. He invites feedback on ways to make Pally DPS more reactive, so go make your thoughts known in the thread if you have any ideas. Exorcism can no longer be used on players originally appeared on WoW Insider on Tue, 21 Apr 2009 18:30:00 EST. Please see our terms for use of feeds. Once you reach Champion rank in the Argent Tournament, this daily quest will open up for all Tournament participants no matter your faction. It can be acquired from Squire Artie within the Argent Pavilion and is among the most straightforward of daily quests. Artie is in charge of the makeshift chapel's collection plate, and is asking you to make a donation. You give him 10 gold, you get 100 reputation with the Argent Crusade as a reward. Like the Sunwell Plateau's A Charitable Donation, this quest's only purpose is to let you get some easy added rep. If you don't feel like knocking out that last Heroic to finish your trip to Exalted, you can just do this quest. Do you have a ton of gold but don't have much time to run heroics for reputation at all? Do this quest on a daily basis, and you'll eventually get rewards. You don't have to do this quest, and not doing it has no negative impact on your Tournament progress. When you reach Exalted with the Argent Crusade, you no longer receive any reward for completing this quest. I'm sure a number of you will think to yourselves, 'Did this quest really need a guide?' Considering how many people stare dumbfounded at this Squire on my home server trying to figure out his purpose, I say yes. It did need one. Argent Tournament Dailies: Contributin' to the Cause originally appeared on WoW Insider on Tue, 21 Apr 2009 18:00:00 EST. Please see our terms for use of feeds. Please note that this post contains spoilers for the raid dungeon Ulduar. If you don't want to be spoiled, please stop reading. The above image has been blurred for your safety. You have been warned. Wraith of EU-Ysondre has been hard at work toppling the hard modes required to access Algalon the Observer, the true final boss of Ulduar. They've yet to defeat Agalon, but they're one of the first guilds in the world to even see this boss in person. 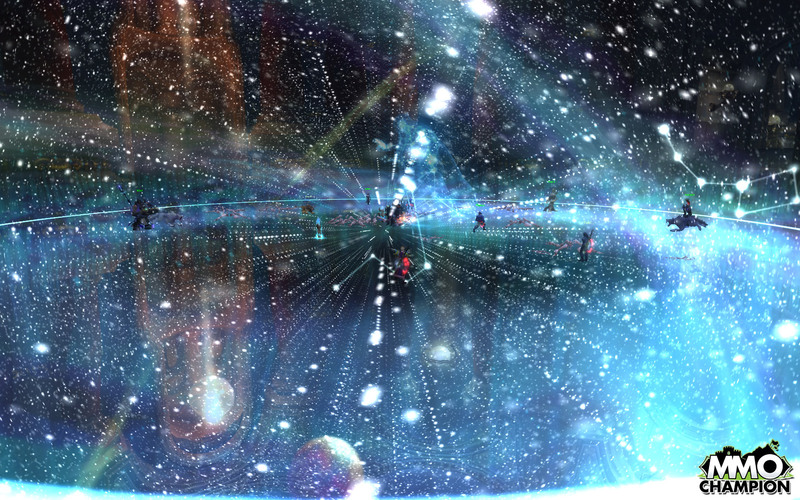 MMO-Champion has a whole load of pictures from their raid, and I have to say... they're pretty trippy. It makes the psychedelic blues of the Malygos encounter look tame in comparison. The encounter also has an added hook to it: Upon reaching his chamber, you're given 60 minutes to fight him. After those 60 minutes, he despawns for the day week and you're out of luck. Spoilers: Preview of Algalon the Observer originally appeared on WoW Insider on Tue, 21 Apr 2009 17:30:00 EST. Please see our terms for use of feeds. to answer what hasn't been addressed already. Ready? Set? Let's go! "I may be wrong but it seems to me of all the in-game non-combat pets, there are no dogs but plenty of cats. What's with the lack of dogs? My mage wants a puppy." The Queue: Cats rule, dogs drool originally appeared on WoW Insider on Tue, 21 Apr 2009 17:00:00 EST. Please see our terms for use of feeds. This is really interesting -- our friend Tommy Tallarico of Video Games Live recently did a show in Austin, Texas, and during the performance, they actually brought former Blizzard composer Jason Hayes up on the big screen via Skype and chatted with him about the Warcraft music they had just played. Hayes worked on some of the cinematic music for Warcraft III, and though he is no longer with Blizzard, he put together some of the new music you're hearing now in Wrath of the Lich King as well. Hayes talks about how he works closely with the cinematic team to try and come up with an appropriate mood for what's happening on screen as the music plays. Even with early animatics, he says, you can get a good sense of where the scene is going and what the story is about. He also says that the Latin lyrics in his songs aren't necessarily Latin -- he uses a translator online and picks and chooses what sounds best. So not exactly historically accurate, but it's Warcraft -- as long as it sounds good, they can justify it however they like. It's definitely a fun little chat with one of the people behind some of the sweet sounds of Azeroth. Video Games Live interviews Jason Hayes in Austin originally appeared on WoW Insider on Tue, 21 Apr 2009 16:00:00 EST. Please see our terms for use of feeds. If it wasn't any more clear, Nethaera made a couple of responses in a thread over at the forums complaining about the itemization of Argent Tournament rewards. She reiterated that Blizzard's design philosophy behind the event was to cater to the "casual players who may not take part in regular raiding". She also teased that "there is more to the Tournament than what is currently available." The original poster complained that there was no epic item for Restoration Shamans. Other players chimed in with how iLevel 200 items this deep into the expansion made no sense. On the other hand, the weapons are flat out awesome-looking, and fairly easy to get at a casual, if somewhat glacial, pace. Blizzard insists that the content is designed for the "fun and flavor" and in that sense the Argent Tournament probably works. Still, gear is a compelling reason to play -- something Blizzard has acknowledged on numerous occasions -- and this is why the Argent Tournament rewards are less than appealing. Particularly in a World of Warcraft where even casual players can PUG 25-man raids for a shot at iLevel 213 gear or higher. In the new, more accessible raid design philosophy, even casual players can experience the so-called endgame. That's the true success (or some may argue, the failure) of Wrath. Argent Tournament is for the casual player originally appeared on WoW Insider on Tue, 21 Apr 2009 15:00:00 EST. Please see our terms for use of feeds. Our sister site Big Download has the PC patch files for patch 3.1.1 mirrored. The download is only 8 megs in size, so it shouldn't take you too long at all if you download it from them. However while the Blizzard downloader is working now, you might not have much luck later on. The Blizzard downloader has been known to crumble under intense usage (I know it's counter intuitive given the Blizzard downloader works off torrents, but it's what happens). Big Download will be getting the Mac patch up soon enough, and we'll update this post when they have it. Patch 3.1.1 download mirror originally appeared on WoW Insider on Tue, 21 Apr 2009 14:00:00 EST. Please see our terms for use of feeds. But maintenance has been extended until 1:00 p.m. PDT / 4:00 p.m. EDT. There is no indication why the maintenance has been extended, but that's the norm as well. You can find out what's in the patch over on the Patch 3.1.1 Patch Notes and Bug Fix List, as well as by checking out our updated Guide To Patch 3.1. We'll update this post with the latest news / server status when we have it. Maintenance extended by two hours originally appeared on WoW Insider on Tue, 21 Apr 2009 13:51:00 EST. Please see our terms for use of feeds. Lopping off heads in Age of Conan might soon be taken very personally, as ShackNews has reported that some fancy face-importing technology is being prepared for use in-game -- you're bound to be just a tad more put out when you see your actual face rolling away on a decapitated noggin. The technology itself comes from a company called Big Stage Entertainment, and you can already get a feel for how it works at their website by registering an account and creating your own 3D "@ctor". This weekend saw one of the largest beta key giveaways in MMO history with tens of thousands of special codes being handed out at once by several different outlets. Aside from the normal MMO news and fan sites, the Free Realms Twitter account has been giving away a thousand keys at a time. Patch day in an MMO is always hit or miss, but according to a number of sources, Mythic's 1.21 patch for Warhammer Online broke many core components of the game that still haven't been fixed several days later. A public acknowledgment appeared on the WAR Herald this past weekend, but some players are still furious. MMO Roundup: Last week on Massively originally appeared on WoW Insider on Tue, 21 Apr 2009 13:00:00 EST. Please see our terms for use of feeds. Having problems getting patch 3.1.1 to download? Thinking that WoW Insider is crazy for announcing a patch without the download happening? Well, we might be insane, but we're not crazy. If you've converted to a battle.net account, you cannot download the patch via the traditional log-in-and-it'll-start method. To get the patch to download, enter your old non-battle.net username and password and the game will begin downloading patch 3.1.1. It's about 10-megs. You can't log-in and play the game with that user name and password anymore, but you can get the patch with it. Seems that Blizzard hasn't worked all the kinks out of the battle.net account system. But at least there's a way around the problems this time. Update: Articles goes up...and 45 minutes later it's fixed! Many thanks to our twitter followers who let us know about this! How to download Patch 3.1.1 with a Battle.Net account originally appeared on WoW Insider on Tue, 21 Apr 2009 12:15:00 EST. Please see our terms for use of feeds. I'll admit that I got to preview some of this new video, courtesy of Gigi. Long story short, the Hall of Fame of Belf Rap have come together to form a machinima rap supergroup called A6. (That's for Azerothian 6, you see.) Backed up by the awesome machinimator Red Eye Lobine, A6 has now released their first video -- Honor Killz. The music itself was pretty good. I'm not a rap guru, so I can't evaluate it in terms of skill. However, I find the conglomerate of six people working the lyrics and tune to be very interesting. The way the song "talks" to itself made it something more than just a parody song. As I mentioned, there was a skit within the video. I think the skit has a lot of personality, and was pretty amusing. It was definitely a good call to add some narrative content in the video, which helps provide its audience a sense of A6's relationship. They're not just a one time team-up, but people who know one another in some capacity. Ultimately, "Honor Killz" is a worthy opening for the group. Let's see what they do next. Check out Honor Killz by A6 for yourself on Myndflame. WoW Moviewatch: Honor Killz by A6 originally appeared on WoW Insider on Tue, 21 Apr 2009 12:00:00 EST. Please see our terms for use of feeds. As we posted earlier, patch 3.1.1 is going live today. The official patch notes have now been posted to the WoW forums. Here are highlights; I'll put the full patch notes behind the cut. In order to address issues with the dual talent specialization system, all players will have their talents points refunded. Players who have purchased dual talent specializations will have both specializations reset. Glyphs will not be affected by this reset. Yeah, it's a pretty small patch. Patch 3.1.1 notes released originally appeared on WoW Insider on Tue, 21 Apr 2009 11:47:00 EST. Please see our terms for use of feeds. Every Wednesday (usually), Chase Christian of Encrypted Text invites you to enter the world of shadows, as we explore the secrets and mechanics of the Rogue class. This week, we discuss how to properly use a DPS spreadsheet. Patch 3.1 is finally released, and there is a ton of new gear available for Rogues. The Argent Tournament has some great gear for newly 80 Rogues looking for solid-quality blues and epics, Ulduar has over 800 new items (more than all of TBC's raids combined), and Arena Season 6 should be starting next week. There's multiple new epics for every slot and for every playstyle. With this sudden influx of new gear, the infamous Rogue spreadsheets have seen a huge increase in download traffic. While I haven't seen any officially updated sheets from our friend Vulajin, Aldriana has published a pair of new Mutilate and Combat spreadsheets. While not quite as pretty as Vulajin's, Aldriana's has all of the major features that you need to plan your gear upgrades. Read on for detailed instructions on how to use a spreadsheet. Encrypted Text: How to use a spreadsheet originally appeared on WoW Insider on Tue, 21 Apr 2009 11:00:00 EST. Please see our terms for use of feeds. Baron Rivendare's mount may be significantly easier to get in Wrath of the Lich King -- it's now a 1% drop as opposed to the previous one in five thousand chance -- but it's still quite a grind. After winning the rare steed, Mat decided to immortalize his new prize in a few screenshots from around Northrend. "The scene is all that the game is to me," he writes. "The desire to explore the beautiful world of Azeroth and discover truly epic moments like this." I hope you and your horse are very happy together, Mat. But not in that way. Around Azeroth: Worth the wait originally appeared on WoW Insider on Tue, 21 Apr 2009 10:00:00 EST. Please see our terms for use of feeds. I enjoy lore, and I enjoy comics. And if you're reading this, you're also probably like me and enjoy the World of Warcraft. So why not combine all those into a nice little contest? Blizzard EU is running a lore contest for their European customers, with the winners receiving a signed action figure. And sorry North American folks, right now this contest appears to be EU only. The quiz is a series of 10 questions, and while I won't give away the answers, the answer to number ten, "Who slays Onyxia?" is clearly "You and 39 friends, or just you." Because my solo warrior skills are just that leet. Head over to check out the rules and enter the contest, after all, you've got nothing to lose! Update: I wrote this article late yesterday evening, and at the time there was no North American version of the contest. However since then, Blizzard has posted a similar contest for North American residents. Enjoy! Blizzard EU & NA comic and lore contest originally appeared on WoW Insider on Tue, 21 Apr 2009 09:00:00 EST. Please see our terms for use of feeds. Sometimes the title of the post says it all. Is your raid leader requiring dual specs? If not, is he or she planning to? While I've retired from my raid leading responsibilities, back in the day I probably would have "asked nicely" a few people to pickup dual specs, even going as far to have the guild pay for it. Of course the people that I asked would have likely been doing it on their own anyways. For instance I had an awesome Paladin tank who did just as good as DPS. Right now the primary situation where dual specs are useful revolve around 10-man groups. Some fights are quite healing intensive and less of a DPS race. Those would benefit from having a hybrid switch from DPS to healing. 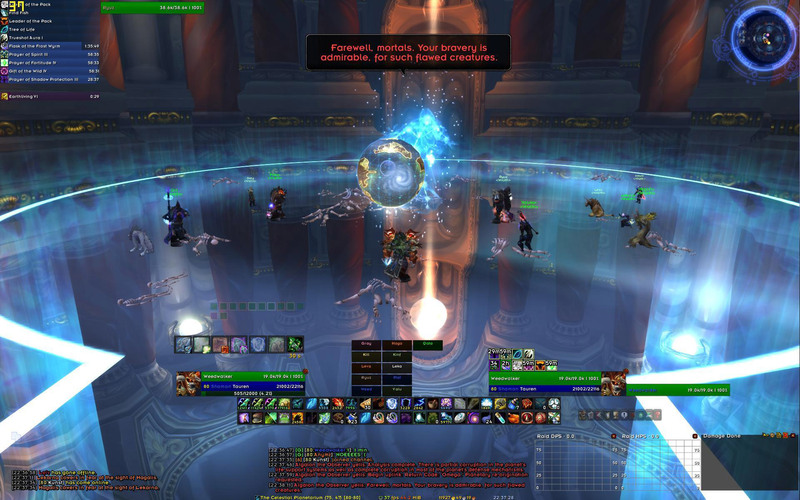 An elemental shaman switching over to resto to heal the raid can make a major difference. So how about it, is your raid leader making you dual spec? Breakfast Topic: Is your raid lead requiring dual specs? originally appeared on WoW Insider on Tue, 21 Apr 2009 08:00:00 EST. Please see our terms for use of feeds. Welcome to Patch Day! Seems like we were just here, doesn't it? But anyway, it looks like we're headed for 3.1.1 today, which is mostly be bugs fixes that were a bit too involved to be applied via hotfix. That, of course, means we get an extended downtime again, from 3 AM to 11 AM Pacific time. When it rains, it seems it pours! This time, hopefully there won't be any free-playtime-worthy unexpected downtime. Tuesday Morning Post: It's Patching Again edition originally appeared on WoW Insider on Tue, 21 Apr 2009 05:30:00 EST. Please see our terms for use of feeds. We've been talking about a new small patch for tomorrow most of the night. MMO-Champion has confirmed that patch 3.1.1 is going live tomorrow. The patch notes just point to a forum thread that outlines the bug fixes we posted earlier this evening (which includes a free talent respec). Now while I'd love real patch notes, having a forum thread with the latest updated information on it isn't a very bad way to do things. We'll keep our list updated as well, and let you know if anything changes (as of 1:10 a.m. EDT it hasn't). If you have time tomorrow fire up your client before you leave for work or school to grab the patch while you're away. We'll get a download mirror up as soon as we can for you. For a comprehensive listing of everything that's changed in Patch 3.1 and Patch 3.1.1, check out WoW Insider's Guide to Patch 3.1. Patch 3.1.1 is live, giving us many nice bug fixes. Patch 3.1 takes us into Ulduar, delivers us dual specs, and brings significant changes to all the classes! Check out our Guide to Patch 3.1 and the official patch notes! World of Warcraft Patch 3.1.1 originally appeared on WoW Insider on Tue, 21 Apr 2009 01:15:00 EST. Please see our terms for use of feeds. Tongiht Bornakk has released another long list of in-game fixes that has already been applied today. He notes that these changes might not become active until after the servers reset tomorrow from the maintenance, so we don't know for sure what's in and what's out yet. Some of these changes would affect Ulduar raids tonight if they are already live. All of the additional creatures spawned during the XT-002 Deconstructor encounter can now be snared in either difficulty. For the Hodir encounter, the damage from Champion of Hodir's Freezing Breath has been reduced, the haste effect from Starlight has been decreased, and the timer for the hard mode has been decreased. For the Thorim encounter, the Runic Colossus should stop channeling Runic Smash once engaged in combat, the Dark Rune Champion should no longer whirlwind after being disarmed, and the Runic Colossus should no longer melee when it charges. The full list of today's changes, and previous changes, after the break. In-game fixes for April 20th and April 21st originally appeared on WoW Insider on Mon, 20 Apr 2009 22:00:00 EST. Please see our terms for use of feeds.